Super Aloe is intended for the relief of occasional constipation. Cape aloe, the solid residue obtained by evaporating liquid aloe ferox, has been shown in the research to affect regularity due to its influence on colon peristalsis, which it triggers to contract, resulting in accelerated intestinal passage. 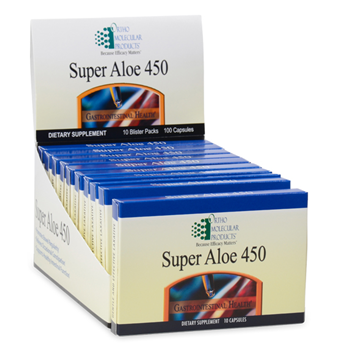 This formulation Super Aloe 450 is available in convenient blister packets.